What's going on here? Well, two quite different things. 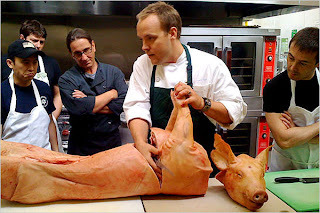 The omnivores were taking a hog butchering class. The thought, for some of these people, seems to be this: if I'm going to eat pigs, I ought to be prepared to see up close and personal what it is involved in transforming them from living, breathing creatures into cuts of meat. Now, this sort of thought can be taken to extremes. "If I can kill pigs myself, then it's OK; if I can't kill them myself, then it's wrong." It's not that simple. You could be able to do something (abusing your kids) that isn't OK. You could be unable to do something (making a surgical incision) that is OK. I was in Africa wearing a Robert Redford Out of Africa hat. The sort of hat that just makes you ache to kill stuff. I have a theory about hats: they really do maketh the man. There's a lot more about hats. (Do readers think this guy is clever?) Then the killing urge comes along. What's it like? Well, just as the animal is insignificant, so is the killing urge. So I’m in Africa, in a hat, with dark intentions and a truck full of guns and other blokes in hats. Josh the hunter said: “Why don’t we shoot a baboon?” All nonchalant, looking out of the window at the amazing Tanzanian acacia scrub that drifts into the Serengeti plain. What about a baboon? Oh sure. What the hell? But then it turns out it's not just optional. And here’s the thing. If you tool around the beautiful and unruly bits of Africa long enough in the company of gangs of men in purposeful hats, sooner or later you’re going to do baboon. You think you’re not, you think you’re the exception, you’re going to just say no to baboon, but pretty soon it’s the monkey on your back. I should have worn my Stella McCartney hat. I took him just below the armpit. He slumped and slid sideways. I’m told they can be tricky to shoot: they run up trees, hang on for grim life. They die hard, baboons. But not this one. A soft-nosed .357 blew his lungs out. We paced the ground. The air was filled with a furious keening of his tribe. Two hundred and fifty yards. Not a bad shot. So much for this animal's life. And then...what's this? A moment of reflection? I know perfectly well there is absolutely no excuse for this. There is no mitigation. Baboon isn’t good to eat, unless you’re a leopard. The feeble argument of culling and control is much the same as for foxes: a veil for naughty fun. They might, at some unspecified theoretical future date, eat birds’ eggs, young impalas and dik-diks — they are opportunist omnivores. You wouldn’t trust one to baby-sit. But then everything has to eat. Too bad this reasoning didn't come a little sooner. But then it turns out it really wouldn't have made a difference. Gill isn't actually like all the other guys who go to Africa and do baboon. He has deeper and more peculiar urges. I wanted to get a sense of what it might be like to kill someone, a stranger. You see it in all those films: guns and bodies, barely a close-up of reflection or doubt. What does it really feel like to shoot someone, or someone’s close relative? Uh, now might be the time to lock this guy up. Really. What is it like to kill an old lady? Or maybe three toddlers? Perhaps we shouldn't wait for curiosity to rear it's ugly head again. When the baboon is lying there on the ground, Mr. Gill has a few moments of exquisite sensitivity. "Look at me. I'm not a thoughtless dolt. How could you think that about me?" But, as so often happens in life, when you stare into the magnifying glass at a profundity, it’s the prosaic and pitiful that’s reflected back. He looked much smaller dead; the elegant and nimble black fingers were terribly human, with their opposable thumbs, just a couple of stops down the Metropolitan line of evolution. I examined his fingernails with the same surprise and awe I did when my children were born. But then the truth is revealed. And then you look in his mouth, and there’s the difference. One of the most ferocious gobs in all the wild, incisors the size of a leopard’s. You see? The animal really deserved it, because he had such big teeth. This guy's an idiot. That's all I have to say on the subject. Incredibly superficial and narcissistic, but it's a culture that promotes that kind of person, sees him as cool and gives him so much coverage. It's also tied in with the idea that the world is yours (if you have the money to pay for it), you buy any possible experience (and the appropriate costume). It's as obscene as sexual tourism. It's sexual tourism's first cousin. Yeah that's some pretty sad reasoning there. I think that logic is the norm though on these issues I'm afraid. Just refering to that guy. I think there is some merit to the do-it-yourself stuff. I'm not sure I would be so ready to link these two stories. The piece by A. A. Gill is merely another datapoint in a long series that merely serves to underline that he is not someone that I would wish to share an acquaintance with under any circumstances. The full knowledge of what we are doing when we eat meat, however, is something that I think is valid. Too many people do not think on what lies behind the neatly packaged morsels lining the supermarket shelves. There was a series on BBC TV about two years ago that showed a studio audience, without any shying away, what goes on in the process that starts with a living animal and ends with a meal. They built an abbotoir and a kitchen in a studio and showed everything from beginning to end. Oh, and for the record, I remain an omnivore. Ahhh, I loved the Faber book. Great creepy stuffy. I'll have to try the other. I agree with you that Gill is in a different moral category than the student butchers, so maybe I do the latter a disservice by putting them in the same post. Thanks for this post. I've been thinking about this trend since Pollan's books started coming out. Your point that "being able to" does not equal "should" is well put. Stephanie, I was thinking the same thing. It's Pollan who must ahve started this trend--both with the the DIY chicken killing he talks about doing in The Omnivore's Dilemma and the article about wild boar hunting he wrote for the New York Times a few years ago.